How the Empire will vote remains to be seen with no recent polls available. 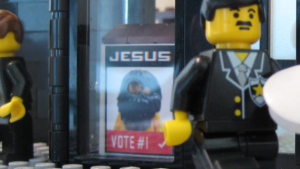 Independent candidate Jesus however will be hoping to secure a spot in the Hall of Minifigs and get his living standards back on track. Limited democracy will return to Legoland on Tuesday 1st August after the Council of the Empire confirmed it will oversee a snap General Election to be contested by approved political parties. The leader of the winning party will be appointed Prime Minister and shall be bestowed powers second only to the Emperor. Under directorship from the Emperor, the Council will relinquish the day-to-day running of the nation to the new Prime Minister. In a statement issued by the Council, the body confirmed it will remain in an advisory capacity to the Crown and following the transition will act as the communication channel between the parliamentarian government and the Winter Palace. In October 2015, shortly after the removal of the military junta, the Council of the Empire was established to assist the Emperor run the more mundane aspects of government which were deemed too boring to deal with on a personal basis. The body comprises 7 minifigs which were hand-picked by the Emperor for being loyal but also for having personalities completely void of charisma and inspiration. These ‘qualities’ were thought to considerably reduce the likelihood that should one or more of the executives ever let power go to their head they will have fewer followers and be easier to purge. The Council administered the 4 government ministries between October 2015 and July 2017 whilst the Emperor busied himself implementing his visionary plans. 6 political parties and one independent candidate have been approved for participation in the forthcoming election and will contest the 22 electoral seats available in the Hall of Minifigs. 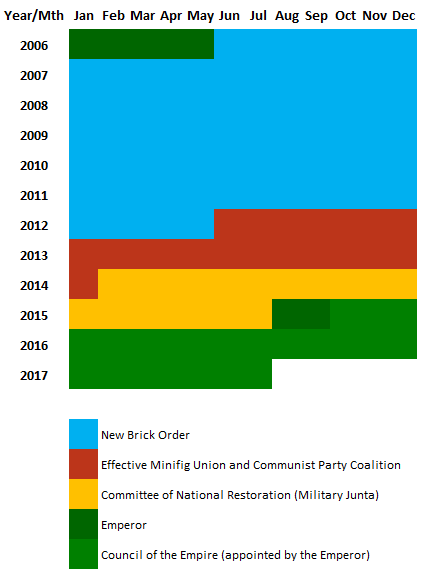 The approved parties are the New Brick Order, the Effective Minifig Union, Everyone Deserves Bricks, the Communist Party and the newly formed groupings Democracy NOW and Not In My Baseplate. The sole independent contender is Jesus. The far-right Legoland First party will not be on the ballot having been outlawed following accusations from the Council that they backed the February 2014 military coup. The coup toppled Legoland’s last parliamentarian rule. The Castleland Independence Movement and the Castlefig Movement for Change will also be prevented from national elections although they may run in local elections in the Castleland Autonomous Region. The Green Party meanwhile have announced their disbandment and advised supporters to back the EMU. With just 6 days to go before the election, there is little time for the parties to mobilise their traditional base and convey firm policies. State television RTL will however host a televised leaders debate on Saturday evening. NBO leader Robert Goldman told the press that the reinstatement of party politics was “essential to restore faith in the State” and his party were “ready to take up the reins and move country forward”. Rather than blaming members of the military, Goldman pointed the finger of blame for the rise of the junta firmly at the hands of the Communists.